I’m one of those people that loves to speak from the stage. Because serving your people is always worth the time. When you hire a speaker, you want someone who will help make your event stand out as 1) one of extreme value, 2) one that makes people want to come back year-­after-­year and 3) one that aligns with your brand, message and tribe. That’s why my goal is that people rave about YOU and your brand as a result of inviting me to your event as a keynote or breakout speaker. I have spoken to audiences as intimate as 5 people up to 5,000++. 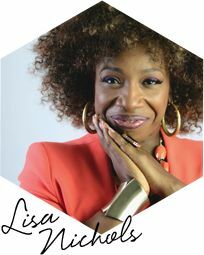 I am part of the Motivating the Masses Speaking Team, part of their World Class Speakers Alliance and one of the top business coaches along with Lisa Nichols, NYT Best-Selling Author and one of the world’s most requested speakers. Our team is one of the highest requested in both the transformational and business development space. We also specialize in training YOU how to become a master storyteller and influential speaker, all while building a profitable business at the same time. Check out more about Motivating the Masses here. I can also customize a talk for your special event based on desired theme. You just let me know and I’ll conjure up a message or keynote that will have your audiences talking and even better, acting on what they learn. …and many other live events in a city (or online) near you.